Destiny's story opens during the "present day", as Earth's first manned mission to Mars stumbles upon the massive sphere known as the Traveler. The Traveler shares advanced technology with humanity which ushers in a golden age in which mankind colonizes the solar system. The Traveler's ancient enemy, the Darkness, eventually finds it and humanity is nearly wiped out in the onslaught. The game begins years later, when one last fortified city remains on Earth that is the home to the Guardians, protectors of the city and the Traveler. And, yes, you are a Guardian, too. Guardians come in three classes, each of which is aligned to one of the character traits in the game. The primary stat for Titans is armor, and they are the soldier/tank class of the game. Play a Titan if you're looking for more of an archetypical FPS character. The Hunter's primary stat is agility, and it is the stealth class. This class gives you the ability to cloak and move in for up close and personal kills. Lastly there is the Warlock whose primary stat is recovery - basically how quickly special attacks recharge. The Warlock is the most unique class of the three, and is a bit like a Jedi with a Force push melee attack and reliance on devastating energy grenades which give you the feeling that you're casting spells. New abilities are unlocked as you gain levels, and each class can specialize with a subclass at level 15, so there's a little bit of customization available for your characters as you progress through the game. There are also three races to choose from in the game, but outside of your appearance when you're walking around the Tower your choice of race doesn't have any impact on the game. 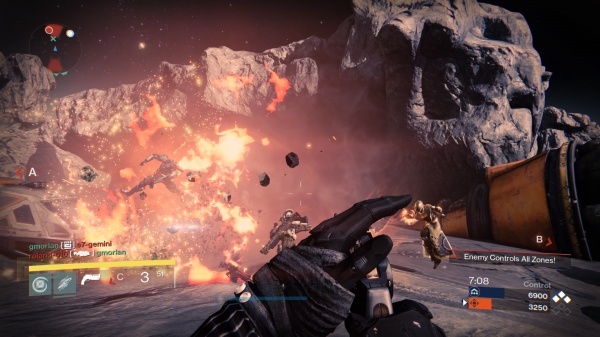 When you first sit down to play the game, you'll find that Destiny is different than most shooters. There's no "New Game" option and no choice of difficulty levels, and you have to be connected to the Destiny servers to even play the game. You can play through all of the story missions solo or co-op, but even if you forgo co-op play entirely as you make your way to the mission starting point you'll see other players and can join them in fighting the enemies that roam the common zone. Random events occur in these areas as well, and players can join together to defeat a boss-like enemy or defend a zone against an enemy onslaught, and then move their separate ways after. If you're concerned about the idiotic chatter that plagues many multiplayer shooter games, you needn't worry about it since in Destiny players have to give their consent to open up an audio chat channel between them. It can make things eerily silent at times, though, as players can come together for an event and then part ways without uttering a word in between. If you're looking for a purely single player experience, there are other things about Destiny that make it different than a strictly single player shooter. There's a lot to the story created for the Destiny universe, but the game takes an almost MMORPG approach to its storytelling in that the information is doled out slowly and in small bits as if the game is in it for the long haul - and with plans in the works to keep expanding and evolving the game, it probably is. In addition, a lot of the lore is delivered through the Bungie.net website, unlocked by discovering hidden 'Grimoire' cards in the game and then reading their content online. All of this means that you'll often find yourself in a mission with only the vaguest idea of what's going on and why your mission is important to the war against the Darkness. Further complicating things is the fact that there are various factions within the Darkness that are not above shooting at each other and it's never quite clear why, and the game has a love of bombastic dialog filled with references to things that make you feel like you're watching the third movie in a trilogy without having seen the first two films. 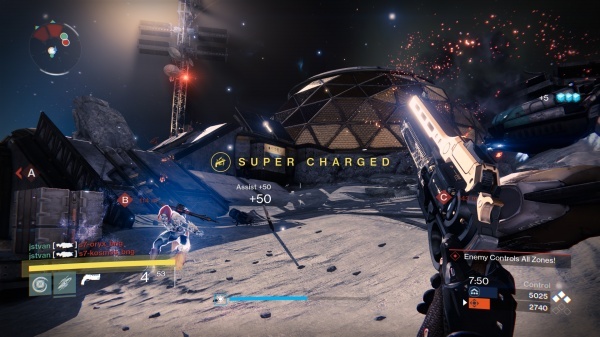 Another thing that makes Destiny different from other shooters is the mission design; the missions feel like they were designed more with co-op play and replayability in mind than for an immersive single player experience. The missions are pretty similar to each other, and usually involve you fighting your way through clusters of enemies, facing a mid-mission mini boss, fighting through more groups of enemies, and then finally reaching the end objective which has you either taking on a boss fight or defending against successive waves of an enemy onslaught. Don't get me wrong - some of the mission-ending fights can certainly be fun - but there's nothing that really distinguishes one mission from the next outside of the environments and the combination of enemy types you'll face. The mission-ending battles are where the lack of difficulty settings really comes into play. The enemies in each mission are given a set level, much in the same way enemies are in an MMORPG, and while the game only opens up new missions a couple at a time, it is possible for you to take on a mission that is above your level, and if you're a casual shooter player it make the going too tough for you. Since there's no option for you to lower the difficulty level, you'll have to either recruit someone to come along with you to help out or do a little grinding to level-up. If you take the grinding route, you have a couple of options. You can replay any mission that you've already completed, or you can go to a patrol zone. These zones are drop-in/drop-out multiplayer areas where you can roam around killing the enemies that spawn in the area or pick up random mini missions from the mission markers dotting the zones. These missions can generally be completed within a few minutes, and include objectives such as killing a certain number of enemies, collecting a set number of drops, or patrolling a distant spot on the map. Unfortunately, grinding is about as much fun here as it is in MMORPGs, and the grind gets longer the higher your level. Player vs. player gameplay is contained to the Crucible, a fancy name for a pretty standard (but well implemented) multiplayer mode. There are four game types available that gradually unlock as you advance in level. Rumble is deathmatch, Clash is team deathmatch, Control is team-based control point capture and hold, and Salvage is an assault/defend mode. 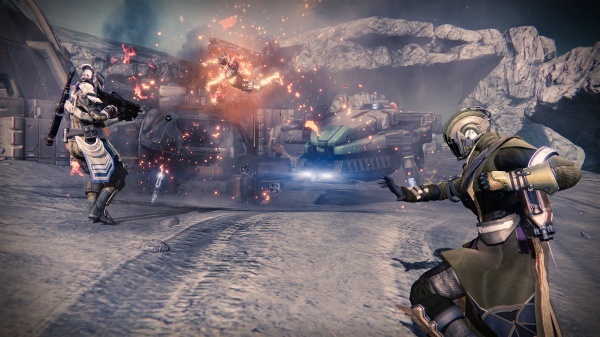 The multiplayer modes in Destiny are more akin to the PvP battlegrounds in MMO games than the multiplayer modes you'll find in most top-tier FPS games in that here's no separate multiplayer progression, you're able to take on bounties that amount to quests that can only be completed in the multiplayer matches, and your performance in the matches translates into the same experience that you earn while playing the story and patrol missions. The multiplayer action is enjoyable enough and the map design is good, but in Destiny the PvP modes feel like more of a sideshow than the main attraction. Outside of the story missions, co-op play is available in the form of Strikes. These are a bit like MMO dungeon encounters and end in boss fights. The Strikes are designed for three players, and the game will handle the matchmaking for you. The bulk of the time you'll spend in a Strike will be in the boss fight, as the bosses take a tremendous amount of damage before they go down. You'll inevitably drain your ammo in the process, so the game also continually spawns lesser enemies during the battle primarily to serve as ammo loot droppers. Of course, you'll need to expend ammo to take them out as well, so the boss battle is also prolonged by them. There's not much strategy to the boss fights beyond spreading out and having one player draw the boss' aggro while the others unload their clips into it. Destiny is not the easiest game to recommend, or not, because it is hard to classify the type of gamer it would appeal to the most. It's too much a shooter and not enough an RPG for the MMORPG crowd, and its stinginess with loot drops, underdeveloped social elements, lack of classes and class customization, and reliance on grinding will send many of those gamers back to other more developed MMORPGs. Shooter fans will find the lack of a coherent story and repetitive mission structure to be disappointing, and although the multiplayer modes can be a fun distraction from some of the game's more monotonous aspects they feel somewhat underdeveloped compared to those in games like Call of Duty and Battlefield. The game does nail the mechanics of a shooter and it's certainly beautiful to look at, but everything else hasn't quite gelled into a cohesive whole. Since Destiny is obviously designed to be an evolving game played for the long haul, though, it will certainly be interesting to see how it progresses and grows over time. Final Rating: 70%. It still needs some time to meet its destiny.